Gossip Girl Season 4 premiered tonight (September 13th 2010), with a BANG. They started off in Paris with BFFs S & B, on an adventurous summer in hopes to heal their broken hearts. While doing so the fashion choices for the Paris episodes are IMPECCABLE! Blaire is back to her headbands & her preppy dresses, etc. While Serena chose many risqué pieces, slinky tops paired with ELECTRIC blue pants, and a Gold Gucci Blazer with shoulder pads. This cant get any better. LOVE LOVE LOVE every outfit. I would say I normally follow Serena's style, but Blaire's is just as top notch! Love these ladies. 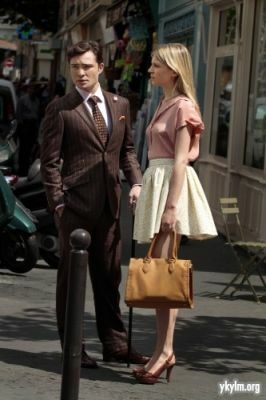 xoxo Gossip Girl Fashion Lovers. Also here is a video of their costume Director Eric Danman & The Cast Speaking About Their Fashion Choices!